The EquiiText business platform provides dozens of features that promote best practices for texting current and prospective customers. The purpose of utilizing best practices when using SMS marketing for your business is to ensure your company is following TCPA and anti-SPAM rules and regulations. In order to make it simpler than ever for our subscribers to safely and effectively text their customers, EquiiText has developed several elements within the Platform to allow for these texting best practices. Which message should I send first? How should I set up my auto-responders? What’s the best way to establish my sales funnel? How can I customize this Platform to my business? These are great questions! Unfortunately, when users are focused only on the marketing aspect of the EquiiText Platform, it is easy to forget the brass tacks of text-message marketing best practices. The number-one issue users face when launching their first campaigns is being blocked by carriers. Carriers like AT&T, Verizon, and T-Mobile keep a close eye on suspicious SMS activity – activities such as sending mass texts to landlines or otherwise invalid phone numbers, rather than cellphones. Thankfully, EquiiText has spent years developing tools to help you avoid carrier blocks as much as possible. 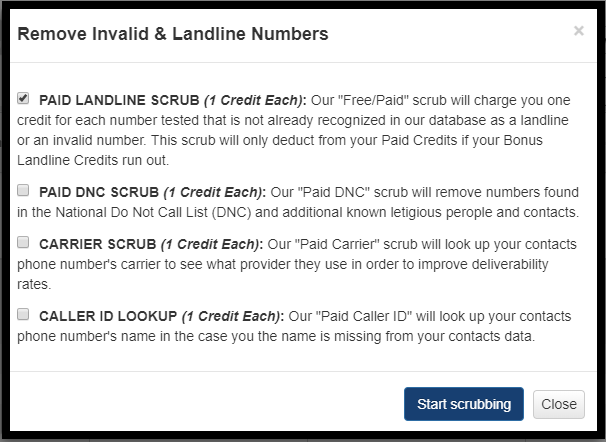 In this case, our Platform offers a feature known as Contact Scrubbing that cleans your lead lists of landlines, invalid numbers, individuals found in the national Do-Not-Call list, and even known litigious persons. After determining which known landlines exist, the EquiiText further scrubs your contact lists against third-party databases to ensure every person you are sending a text message to is a valid SMS recipient. Although the idea of paying one credit for each third-party database landline scrub seems like a lot, the reality is it will save you money in the long run. Paid Landline Scrubs don’t automatically pull credits from your subscription allowance. Rather, it pulls from your Bonus Landline Credits, which are generated automatically with your subscription, equaling the amount of your subscription. For example, if you purchase a subscription plan for 1,000 credits, you further receive 1,000 Bonus Landline credits at no extra charge. This means the chances of the EquiiText Platform being forced to pull credits from your paid subscription are exceedingly low, ensuring you will not spend credits on landline scrubs that could otherwise be used for sending campaigns and paying for your virtual numbers. This is especially beneficial because of those virtual numbers: the more your numbers are blocked by carriers, the more you are forced to pay for new ones. Scrubbing your contact groups of landlines and invalid numbers is one of the quickest, easiest, and most affordable ways to ensure you’re not paying more than you need to on virtual numbers each month. To scrub your contacts, simply import your list to a contact group. 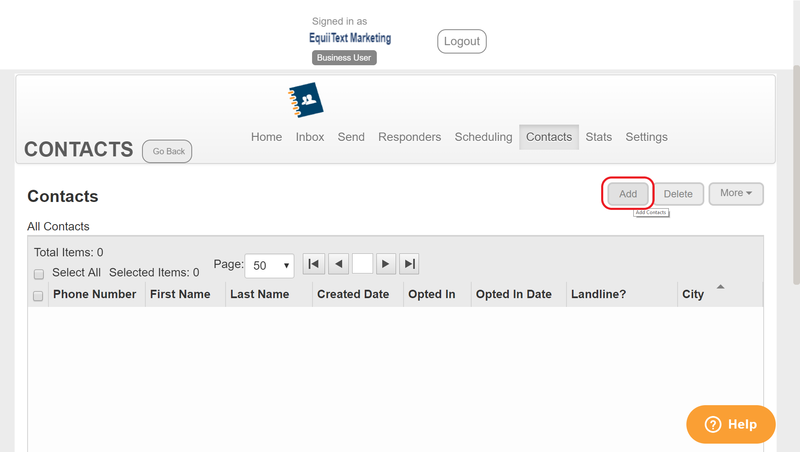 You may create a custom contact group by going to Contacts à Imported and select “Add New Group” in the right-hand corner. Name your group, and then enter it. 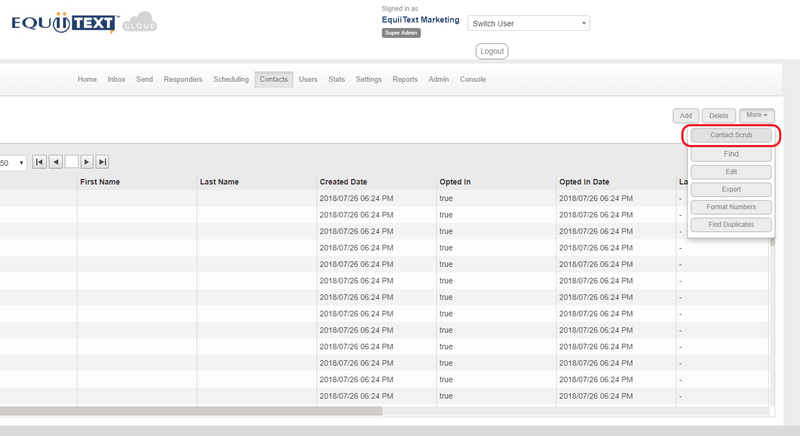 From here, click “Add” and choose to import your CSV of leads. Make sure the first column of your CSV is your contacts’ phone numbers, with only the numbers; delete any parentheses, plus signs, and dashes. The second column should be your contacts’ first names, and the third column is your contacts’ last names. These are the only columns that will import into the Platform. After your contacts are finished importing, select “More.” In the dropdown menu, the first option is “Contact Scrub.” Select it and a pop-up window will appear, asking you which scrubs you would like to select. Even if you aren’t interested in scrubbing your contacts to determine caller ID, name of carrier, or Do-Not-Call, it is an EquiiText best practice to ALWAYS scrub your contacts of landlines and invalid numbers. After this, it’s the perfect time to start establishing your funnels, drip campaigns, auto-responders, and get to SMS marketing the right way! If you want more information on scrubbing your contacts or if you would like assistance in importing your lists, please don’t hesitate to contact an EquiiText representative! Call us, text us, or email us any time. EquiiText is here to help you reach your goals quickly, efficiently, and – most importantly – safely!